This part of Spain is foodie heaven, with a host of splendid, internationally acclaimed restaurants to enjoy, as well as high quality local tapas bars and harbour-side fish restaurants. Lovers of wine will be fascinated with the vineyards of the region, famous for its sweet Muscatel wine. Jalon Valley has a winery where you can sample and buy local wines. Do try some before you go home! 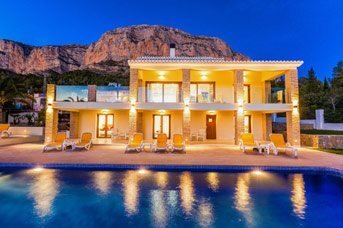 You can choose any one of our villas in the Costa Blanca and enjoy a holiday you will dream about for many years to come. We know how to make you happy! 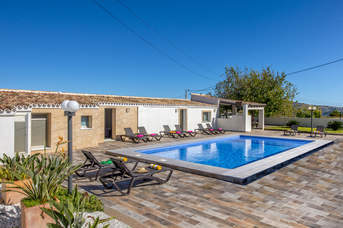 If you just want to relax under a brilliant blue sky, you’ve come to the right place – the beaches are spectacular, and your own pool at the villa is perfect for soaking up the rays. Alternatively, you might prefer a more active holiday, trying some of the many water sports on offer, or exploring the fascinating coastline. Our villas give you a brilliant base from which to explore, or a home from home you need hardly leave at all! But if you do go on an adventure, you will return to a beautiful villa with everything you need to be happy and comfortable. Take a day trip to Valencia! There is so much for you to see and do during your Costa Blanca Villa Plus holiday, that you must remember to leave time to relax! One place you might enjoy is the historic old town of Javea. Like so many seaside resorts here, it was originally a fishing village, but regular raids by pirates drove the townsfolk to move just over a mile inland where they built what is now regarded as the old town, a maze of cobbled streets lined with whitewashed houses, Tosca stone porticoes, gothic bay windows, wrought iron window bars and balcony railings, clustered around the 12th Century gothic church of San Bartolome. Today Javea is a small, historic town, free of high rise buildings, inhabited mainly by warm and friendly people who welcome tourists. Calpe's salt lake known as Las Salinas Natural Park is just outside the town, about 550 yards from the Peñón de Ifach. The salt water lagoon is an important haven for wildlife, especially birds, and more than 170 different species have been spotted here. The lake attracts herons, large flocks of flamingos and other migrating birds at various times of the year. This unusual nature reserve with its reed beds was at one time an active salt works. Whichever location you pick for your villa, be sure to visit the famous daily fish auction at Calpe, run by the local Fishermen’s Co-operative. A special market building was completed in 1991 and decorated with six huge, impressive paintings of fishing scenes and seafaring legends by the artist Elias Urbez. The good news is that it has a viewing gallery so that you can watch the auction in comfort. In Calpe, around 1,700 tons of fish are caught every year by about 160 people in 22 boats. The catch includes gilthead, whiting, red mullet, squid, octopus, grouper, mackerel and several kinds of shellfish. Another town that is good for a day out is Moraira, a charming, upmarket seaside town with narrow cobbled streets and an impressive marina, and stunning views back across to El Peñon de Ifach. Unlike some resorts on the Costa Blanca, Moraira is still very much a Spanish community, and has resisted most of the high rise, mass catering aspects of modern tourism, protected by strict planning regulations. Its sandy beaches are set in eight kilometers of beautiful coastline against a backdrop of forests, vineyards and mountains. The 620-berth Blue Flag marina, built in 1985, is an exclusive yacht haven owned and operated by Club Náutico Moraira, and is a great spot for upmarket shopping, eating and people-watching. 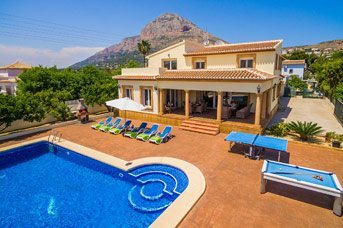 You can choose any one of our villas in the Costa Blanca and enjoy a holiday you will dream about for many years to come. We know how to make you happy! 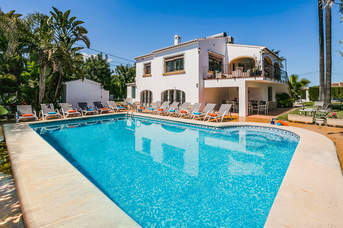 If you just want to relax under a brilliant blue sky, you’ve come to the right place – the beaches are spectacular, and your own pool at the villa is quiet and private for soaking up the rays. Or you can have a really active holiday, trying some of the many water sports on offer, or exploring the fascinating coastline. Our villas give you a brilliant base from which to explore, or a luxury home from home you need hardly leave at all! But if you do go on an adventure, you will return to a beautiful house with everything you need to be happy and comfortable, and a lovely, cool calm bedroom will be waiting for you after the heat of the day. There is so much for you to see and do during your Costa Blanca Villa Plus holiday, that you must remember to leave time to relax! One place you might enjoy is the historic old town of Javea. Like so many seaside resorts here, it was originally a fishing village, but regular raids by pirates drove the townsfolk to move 2 miles inland where they built what is now regarded as the old town, a maze of cobbled streets lined with whitewashed houses, Tosca stone porticoes, gothic bay windows, wrought iron window bars and balcony railings, clustered around the 12th Century gothic church of San Bartolome. Today Javea is a small, historic town, free of high rise buildings, inhabited mainly by warm and friendly people who welcome tourists. Another town that is good for a day out is Moraira, a charming, upmarket seaside town with narrow cobbled streets and an impressive marina, and stunning views back across to El Peñon de Ifach. 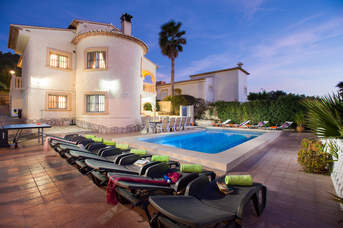 Unlike some resorts on the Costa Blanca, Moraira is still very much a Spanish community, and has resisted most of the high rise, mass catering aspects of modern tourism, protected by strict planning regulations. Its sandy beaches are set in 5 miles of beautiful coastline against a backdrop of forests, vineyards and mountains. The 620-berth Blue Flag marina, built in 1985, is an exclusive yacht haven owned and operated by Club Náutico Moraira, and is a great spot for upmarket shopping, eating and people-watching. Like so many Mediterranean coastal holiday resorts, Calpe, on the East Coast of Southern Spain, was originally a little fishing village. Today it is a busy town, but fishing is still important, and there is a fish auction at the port each afternoon, with chefs from the many excellent fish restaurants bidding for fresh seafood for your dinner! 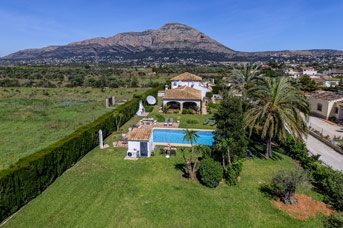 Nestled between the Mediterranean Sea, Montgo Mountain, Valencia and Alicante you will find Javea, a place divided into three distinct parts, each just over a mile apart. Javea's coastline stretches from the Cova Tallá to the Cala de la Granadella, a distance of over 12 miles. 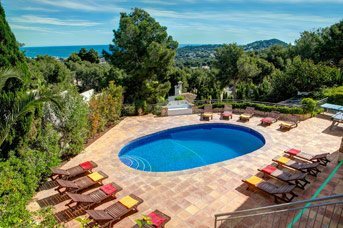 Moraira is a charming, upmarket seaside town, with narrow cobbled streets and an impressive marina, and stunning views across to El Peñon de Ifach, the rock of Calpe. Its sandy beaches are set in 5 miles of beautiful coastline against a backdrop of forests, vineyards and mountains. A region of diverse and colourful towns and cities from the bright lights of Benidorm with its skyscrapers and chip shops to the cosmopolitan resorts of Javea and Moraira to the north. The mountains that surround the area offer mountain top villages, vineyards, citrus groves and wheat fields, with the cities, full of colour and vigour offering a contrast to this laid back style of life. It is easy to explore the Costa Blanca and you don’t even need a car! The Alicante to Denia railway line runs for 58 miles along the Northern Coast of the province of Alicante and stops at around 40 stations, so you can visit Denia or Jávea for example, or go to Altea, a charming, medieval town built on a steep hillside and dominated by the blue dome of the church of Virgen del Consuelo. You can also check out Benidorm, still a top holiday destination welcoming millions of visitors every year to enjoy its great beaches and intense nightlife. You can travel to Benidorm by boat from the marina at Calpe – a great way to see the beaches, coves and cliffs of this remarkable coastline. If your holiday would be incomplete without a few rounds of golf, you have come to the right place! Golf is a very big deal in Spain and at present there are 13 golf courses on the Costa Blanca which are affiliated to the Spanish Federation and can validate members’ handicaps internationally. Club de Golf Ifach, 2 miles from Calpe is part of the San Jaime Urbanisation in Moraira, and a good place to start, but you need to have a valid handicap certificate from your home club with you. It is a 9-hole course with a spectacular view looking back to the Peñón de Ifach. With just one putting green, it is one of the smaller courses around. However, it is deceptively difficult and not for the faint hearted! Javier Arana created the Ifach Club course to be short and tricky with numerous obstacles, so if you like a challenge, this may be for you. The dramatic, gigantic, craggy limestone rock called Peñón de Ifach at Calpe is is over 300 metres tall. It sits in the sea, a mighty landmark that can be seen for miles, towering over the town and dividing the shoreline to create two gorgeous sandy beaches. Since 1987, Peñón de Ifach has been a protected nature reserve providing a safe haven for all kinds of wildlife and plants. For the very fit there is a walking route through a tunnel in the rock that takes you right to the top where the views over the bay are extraordinary. On a clear day you can see as far as Ibiza. Behind the town loom the the majestic Sierra Bernia Mountains, providing a beautiful, dramatic backdrop. Miles of white sand lapped by clean, clear, turquoise waters make the Costa Blanca a beach lovers dream. More than 100 beaches achieve the high standards required for the Blue flag scheme assuring the standards of cleanliness across the region. Good facilities and water sports are available at most resorts whilst those seeking peace and tranquillity can easily find a secluded cove for a day of rest and relaxation. Advocat Cove is made up of gravel and fine sand and has a small breakwater at its Southern most point. This area is also perfect for peaceful walks. There is parking available as well as a beach bar and disabled access. Small pebble coves dotted along the coast of Altea, some have been improved with sand recycled onto the beach. Those close to the hotels have the best facilities although these may be limited to residents. Long stretches of fine sand are separated by the Penon De Ifach towering above the port and Marina. The Arenal is lined by a pedestrianised promenade lined with cafes, bars and restaurants with many open late into the evening. The sand is cleaned daily and there are a wide variety of watersports available. Parking is available along the length of both beaches. The beach is Blue Flag approved and lifeguards are present 1 June to 30 Sept. The famous horseshoe bay of fine sand in the centre of this popular resort has a gentle slope into the sea and is a good place for introducing children to swimming in the sea. There are public showers and toilet facilities plus parasols and sunbeds available to hire. The bay is surrounded by a wide choice of bars and restaurants along the attractive pedestrianised promenade. In the summer you can stroll along the front and enjoy the stalls selling a variety of handmade crafts. The summer months are busy and Arenal is a favourite meeting place to go out and enjoy the bars. Accompanied jet-ski tours are available as is the hire of motor boats and boats for trips. Parking is available along the length of the beach area and there are also bus and taxi stops. The beach has wheelchair access and is Blue Flag approved with a lifeguard usually present from 1 June to 30 Sept. The famous Levante (sunrise) and Poniente (Sunset) stretch the length of this resort gently shelving into the warn sea. Fine sand and well served by beach bars with watersports and facilities along the entire length. Pedestrianised promenade along the length of the Levante beach. Can become very busy during peak season and parking can be difficult. Both are Blue Flag approved and lifeguards present year around. This relatively small cove, approximately 300m, consists of shingle and pebbles. This is a quiet and picturesque bay used by naturists. Cala Blanca Beach has beautiful scenery and an authentic Spanish restaurant. From the distance, you can the boats moored up in the bay by the purple caves. There are a few rock pools to explore and the sea is great for snorkelling. Cala Grandella is small but full of character. Measuring at about 160m, this is a cove consisting of shingle, pebbles and rock with clear water. A lifeguard is present with safety flags indicating swimming conditions. Canoeing is available and sunbeds and parasols are available for hire. Diving and snorkelling are also popular here. Shower and toilet facilities are also present. A bar and restaurant overlook the fantastic view from this bay. Ample parking is available nearby with view points overlooking the bay. Barraca Portitxol is an exceptional rustic cover consisting of shingle, pebbles and rock. This cove looks out to the beautiful Isle of Portitxol. The beach has the advantage of a shallow bay with the water gradually sloping, making it ideal for paddling or shallow snorkelling. There is a lifeguard present with safety flags indicating swimming conditions. Canoeing is available for the more active, along with view points to enjoy the stunning scenery. Toilet facilities are also available. There are a selection of restaurants behind the beach. Cala Pope Tango is a wonderfully unique smaller cove. It is rustic with sand and small pebbles, great for exploring. You can enjoy a spot of diving and this cove also has safety flags and buoys to advise of swimming conditions. There are ample facilities nearby including restaurants and a bar. This is a small cove consisting of shingle and pebbles, with view points and accessible only by foot. Denia has a long stretch of beach from the resort centre northwards towards Olivo. Fine sand and gently shelving, the beach is rarely crowded throughout the year. Well served by beach bars and shower facilities and parking is available throughout the length of the beach. Denia also has a number of smaller coves and shingle beaches providing a peaceful alternative. Blue Flag approved and lifeguard present 1 June to 30 Sept.
El Benissero extends from the Port breakwater along to the Parador hotel. This is a semi-urban open beach with shingles and rocks, making the water crystal clear. This beach is popular for walking. Here you can hire jet skis or take a perch at one of the chiringuitos. Windsurfing and canoeing are also available here at El Benissero. If you want to hire a jet ski you'll need photo ID. There is a lifeguard facility here with safety flags for swimming conditions. Sunbeds and parasols are available to hire and there are also shower facilities. There is also a car park and bus service nearby. A restaurant and bar are also located here. A sandy cove surrounded by high cliffs makes this one of the most picturesque beaches on the coast. The small promenade features a range of shops and some good quality restaurants. The resort centre is walking distance and offers a wide range of facilities and parking. Blue Flag approved and lifeguard present 1 June to 30 Sept.
Granadella Beach is found at the end of a winding lane and has a gravel car park. Lifeguards are on duty during high season. The beach is made up of stones and is popular with the locals, as the water is very clear and there are lots of rocks eith side, making it a lovely cove. There are 2 beach front restaurants available. The pebbly beach runs from the Parador end of the sandy Arenal beach, all the way to the Port. During the summer months this pebbly beach has some lovely beach bars dotted along the route, a great place for anything from breakfast to sun downers and on into the night. Most offer wifi, TV, food and of course drinks. Take a dip in the sea, watch the world go by and enjoy some of the amazing fireworks set over the sea in July (normally) as part of the Moors and Christians Fiesta. The gently shelving beach of L'Ampolla lies just a short distance from the resort centre. Fine sand and with good childrens facilities with a playpark showers available. There is also a beach bar and plenty of parking which also serves the resort centre. Blue Flag approved and lifeguard present 1 June to 30 Sept.
La Fossa Beach, also called Levante beach, is located between the Punta de Bassetes and the Peñón de Ifach a wide bay is formed where this beach is located, one of the most bustling beaches in Calpe. With fine golden sand, it has all kind of services and facilities and in summer nights it becomes an improvised cinema. It is delimited by a well cared waterfront where restaurants, ice-cream stalls and all kind of shops follow one another. The showers are placed in the Promenade Seafrond. La Fossa beach in Calpe has the Blue Flag. Equipment and services: this beach has special handicapped persons facilities, red cross, playground, sports area, restaurants, camping, lifeguards, beach umbrellas and hammocks, parking, walloways, cleaning service and waste bins. You can practice here sailing, windsurfing and beach sports. Urbanization La Fustera is beside Altamira in the Benissa area and joins the sea at the Cala and beach of La Fustera. In the background the first promontary is Cap Blanc of Moraira -Teulada and the second is the Cap d'Or beside El Portet. You can just see the 16th century Cap d'Or watchtower used to warn against Barbary pirates. Benissa's La Fustera beach is a short distance down from the coastal road and is popular with the locals. The La Fustera supermarket open all year is nearby. To the north of Calpe on the winding coastal road towards Moraira are a number of coves and marinas proving clean and safe facilities, well maintained and groomed daily. Each of the coves has access to one of the commercial centres along the coast road. There is parking at each of the coves and some have small beach bars providing drinks and snacks throughout the day. The coves provide excellent snorkelling and boats can be chartered for Scuba diving. Lifeguards are available during peak season. A pebbly/shingle beach close to the port of Javea, the facilities of the town are within easy reach and limited parking is available along the seafront. Blue Flag approved and lifeguard present 1 June to 30 Sept. Bus and taxi stops are also along the beach, enabling easy access. This beach has scenic walks and you can stop at a restaurant there for a bite to eat. This is a semi urban beach with rocks and shingle. Ministre is located between El Benissero and Arenal. You can see here where the Toscan stone used to be excavated. For a beach with more facilities, Arenal is a short distance. Moraira beach has everything you need and you can even choose between fine sand, rocks or pebbles! This beach is not over-populated and has a range of excellent facilities, including beach games, restaurants, washing facilties, a watch tower to admire the amazing view and ample parking. Located close to the pretty town of Altea, Playa de Albir sits at the foot of the Sierra De Helada. The shingle/sand beach has good facilities with beach bar restaurant and many bars and restaurants in the resort of Albir. Plenty of parking nearby although in peak season may be busy with locals. Blue Flag approved with lifeguard present 1June to 30Sept. This is a small rustic cove with shingle and rocks. Surrounded by white cliffs and some rock pools, this cove is only accessed by foot. You can enjoy the stunning scenery from the view point on the promenade. Ample parking is nearby. A small cove with good facilities including a bar and restaurant and a small port with fishing boats and boat for fishing charters. The beach views across to the Penon De Ifach and some of the modern architecture of the resort of Calpe. Parking available. Segon Muntanyar is a semi urban, rough and rocky area of beach that is popular for walking. A restaurant serves this beach and and there are also bus services. There's something about Spain that means that culinary excellence is in its very roots. The country may be a relaxed one, yes, but the flavours and tastes that can be experienced in Spanish cuisine is an exciting adventure, and one that's best experienced in the coastal regions of the country, places such as Costa Blanca. The close proximity to the ocean of course indicates that there'll be plenty of seafood on the typical Costa Blanca menu, but be sure to expect a healthy dose of meat too, along with great use of seasonal produce and locally sourced herbs, spices and oils. For incredibly fresh seafood, why not venture down to the harbour and buy directly from the fisherman? A common occurrence in Javea and Moraira, purchasing straight from those that caught it not only ensures your food is as fresh as it possibly can be, it also means that you’re supporting the local industry – it’s something that’ll taste good and feel good! The Spanish markets are a must-see for many of the Costa Blanca visitors, and there's an abundance of them to explore. 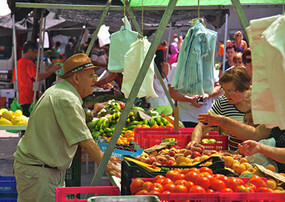 One of the most favoured markets is the one in the town of Moraira, held every Friday morning just behind the town centre. Here you'll find an abundance of fresh, seasonal fruit and vegetables as well as nuts, spices and oils, herbs and dried fruit, along with many non-food items too. A very similar market takes place every Thursday in Javea, too. Be sure to also take a look at the slightly smaller market in Teulada. It takes place on a Wednesday, and is much more of a local market. Here, you'll find more practical items and excellent quality food for a little less than in Moraira. If you've hired a car and are happy to travel a little further afield for produce, then be sure to check out Denia, Altea and Benissa. All of these host markets that are full of local flavour, but be sure to ask about the specific days and times when you arrive in Costa Blanca. 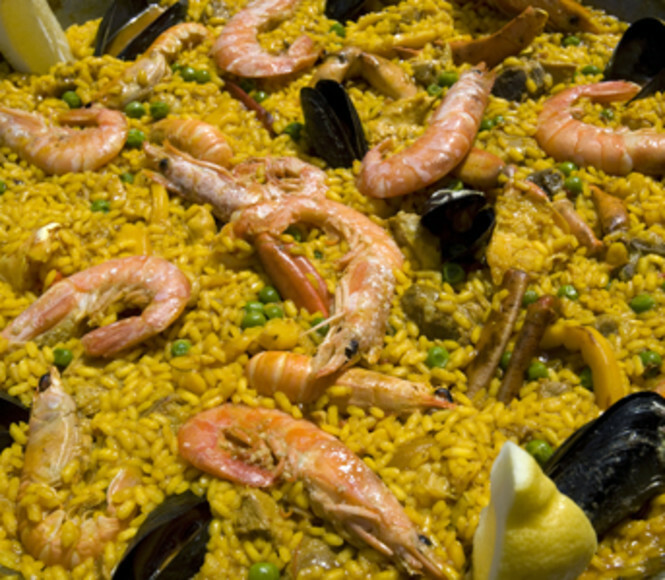 Paella – Perhaps one of the most iconic dishes of Spain, Paella makes use of everything that the country is great at producing. Fresh fish, saffron-infused rice and local vegetables make this dish a tasty treat, and seems to taste even better when ordered in a giant pan to share between you and your guests. Cocido con Pelotas – Though a potage, the tasty dish combines little balls made of egg and parsley that appear in the soup both crumbled and fried. Arroz a banda – At its essence, arroz a banda is a simple dish, though it can be paired with extra bits depending on the preference of the chef. Typically, it is rice that's cooked with dried red peppers to give it a little kick, but is often served up with calamari (squid), shrimp, chicken or pork with garlic. You cannot ignore the prevalence of tapas dishes in this region of Spain, either. Though the above dishes are delectable too, there are few things more exciting in a meal than sharing a few small plates, giving you the option to sample as many bites as possible! This is a growing notion in the UK too, and though tapas dishes feel like they could be difficult to recreate at home, in actual fact they are simple and easy to prepare – perfect to eat with a group of friends and a good bottle of wine. 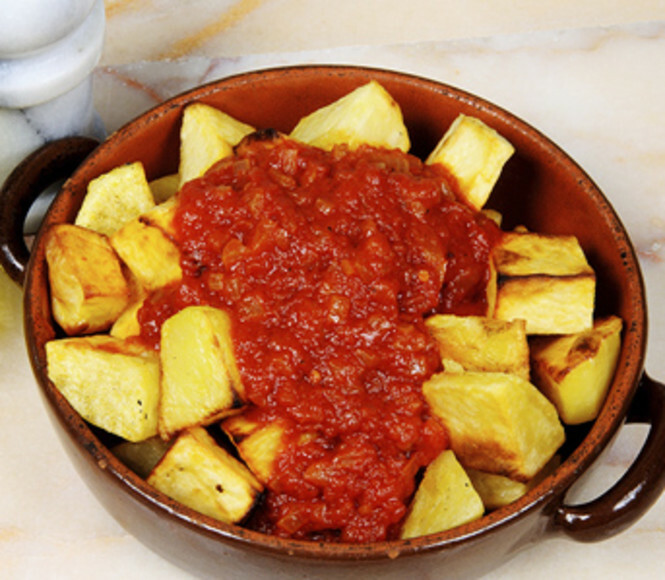 Here, we have easy versions of two Spanish favourites: Patatas bravas with chorizo, and Paella with squid. Enjoy! Firstly, you'll create the very thick sauce that you'll eventually stir into the potatoes. To do this, you need to fry the onion, garlic, chilli, paprika and cayenne pepper in the olive oil until browned. Next, add the chopped tomatoes, combine, and leave it to simmer until a nice, thick paste is formed – this will take around 20 minutes. In the meantime, steam the potatoes for around 10 minutes. In another frying pan, slowly cook the chorizo so that its oils are released. Once the potatoes are steamed, add them to the chorizo pan, and turn the heat up! Once browned, they are ready to serve up with your sauce. To get started, put the olive oil in a frying pan and heat, before adding the chorizo, onion and garlic, allowing to cook until softened. Then add the turmeric, stirring the pan's contents as you go, before adding the prawns, peas and rice along with a good dose of boiling water, around 150ml. Keep stirring until everything is combined and cooked through before serving – don't forget those lemon wedges, they make a great visual addition when plating up!